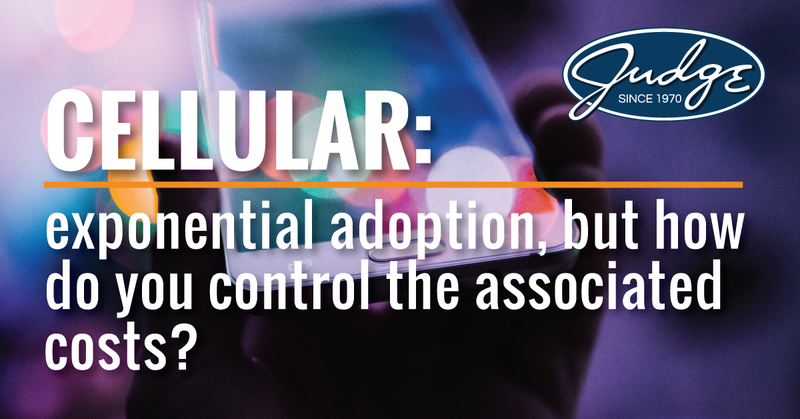 Cellular: exponential adoption, but how do you control the associated costs? As we all have seen, mobility in the workplace is king. Employees require immediate access to email, corporate documents, the internet… we require the world at our fingertips. IDC estimates that mobile workers in the U.S. alone will reach more than 105 million by 2020, and that number should significantly increase as more millennials, who value flexibility and work-life balance over traditional working environments, surge into the work force. This transformation will lead to huge productivity gains and significant corporate savings as the traditional office space shrinks and the mobile workforce continues to take over. According to Forrester, corporate mobile subscriptions and overages generally take up one third to one half of an organization's mobility budget. Much of the rest is devoted to staff tasked with managing mobile device environments that can number in the thousands, along with subscriptions to managed mobility services and telecom expense management tools meant to keep costs in check. These issues highlight the fact that mobility management has evolved into something much more than just analyzing monthly invoices. Using the traditional manual processes each month to collect & review bill data, compile reports, track device inventories & procurement, and interact with service providers is no longer an effective management strategy for a mobility environment. A U.S. defense and aerospace contractor, who was spending over $16 million annually on mobility services, was looking for a more efficient way to manage their associated cellular costs. They had over 27,000 smartphones, tablets, and IoT connected devices in their environment, spread across two service providers (AT&T & Verizon). By implementing a Cellular Optimization solution, the team quickly identified over $430,000 (38%) in first-month savings by shifting plans, balancing usage pools, and eliminating unnecessary or redundant feature packages. The annualized savings comes out to over $5 million, and that's before we've even fully implemented some of our other cost reduction initiatives, such as behavior management. And these are not unusual results, on average we reduce monthly bills by 30% to 50% through a variety of proactive initiatives, and we consistently deliver savings above and beyond that delivered by 3rd party telecom and wireless expense management platforms (TEMs, WEMs). Since all our work is done behind the scenes, changes are transparent to users with no interruptions or downtime. Clients are still billed directly by their provider (although the bill will be lower) and all existing account team relationships remain unaffected. Cellular management today must be daily, not monthly, and manual processes must be supplemented – or even replaced – with automation. The old manual process is simply not going to cut it in the very near future. There are way too many variables, including increases in data consumption by users, constant changes in available carrier plans, and innovations in available devices, that need to be continually monitored. It is imperative that your business starts getting the most out of your cellular plan – both functionally and cost effectively.